Was Jesus the first person to tweet? From my room on Toronto, I caught on CBS news this morning Cardinal Ravasi's claim that Jesus was the first person to tweet. His sermons, the cardinal said, were "brief and full of meaning". Funnily enough, I talked about this in a segment of my online office hours a couple of years ago, Would Jesus tweet? Actually, this has given me a great idea for the next NT Pod. I am on my way to the York Christian Apocrypha Symposium 2013 in Toronto. Today (Thursday) is arrival day for the speakers, but the conference gets going on Friday and continues through to Saturday afternoon. The 2013 York Christian Apocrypha Symposium, “Forbidden Texts on the Western Frontier: The Christian Apocrypha in North American Perspectives,” will take place at York University September 26–28, 2013. The event is organized by Tony Burke (York University) in consultation with Brent Landau (University of Oklahoma). It brings together 22 Canadian and U.S. scholars to share their work and discuss present and future collaborative projects . . .
Tony Burke has been previewing the symposium on his Apocryphicity blog. He has added profiles of speakers over the last few months. I look forward to seeing some of you there. It looks like it is going to be an excellent symposium. For those who can't make it, I should say that I will be taking my blogging machine and I hope to get the chance to chat about the conference here on the NT Blog. How accurate is that replica, and why does it matter? 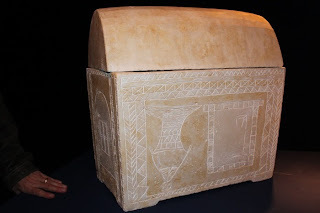 After discussions of the Talpiot Tombs resumed recently in the blogs (see James McGrath, Talpiot Tomb Latest and Talpiot Tomb Representation and Rhetoric), I have found myself reviewing some of the materials and looking back at old contributions. The fact that some time has passed since the excitement of March-April 2012, when details of and theories about Tomb B emerged, actually helps one to get the kind of perspective that only time can provide. One thing that has become clearer to me with the passage of time is the importance of distinguishing between the evidence itself and the project leaders' interpretations of the evidence. Because the academy at large has been broadly critical of the project leaders' theories, it is easy to give the mistaken impression that we are not genuinely fascinated by the materials that they have uncovered. 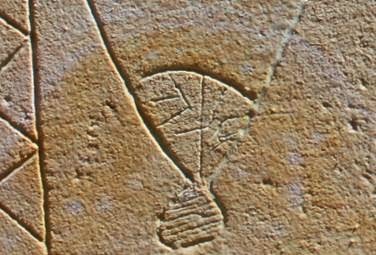 If we have not underlined that sufficiently in the past, it's worth doing it again here -- the new finds in Talpiot Tomb B are fascinating and well worth studying. Nevertheless, our interest in the evidence does not, of course, commit us in any way to accepting the project leaders' interpretations of the evidence. And there is a difficulty here. A lot of the evidence has got bound up with the interpretations of the evidence. Thus, the CGI composite image of the "fish" should only be used as an illustration of Jacobovici's and Tabor's theory. It should not be used, as it was back in March 2012, as if it were an actual photograph. It represents the theory. It is not part of the data set. It is clear now also that both ossuary replicas are best understood as attempts to represent Jacobovici's and Tabor's theory about the tomb. As such, they are very useful. In order to see this, we need to play down the language about the accuracy of the replicas, and especially Replica 2 (e.g. recently in the video interview with Prof. Puech). 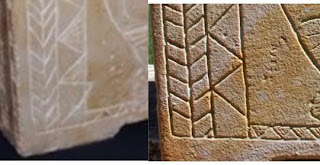 While there are important points of contact between the replicas and the artifacts that they are modelling, there are also important points of divergence. Here, then, Replica 1 is more accurate than Replica 2, and we should treat the claims about the great accuracy of the replica with a touch of caution. However, the point of this post is not solely to point to the problems with the claims of the accuracy of "the replica", but to reflect on what this tells us about how the filmmakers are looking at the photos. Allow me to explain. We already know that the alleged "Jonah" inscription does not feature on Replica 1 but appears clearly on Replica 2 (See A Tale of Two Replicas, and see now also with helpful illustrations in Unfaithful Representation: The Second Replica and A Comparison of the First Replica on Steve Caruso's blog). The reason that that is interesting is that it illustrates the value of the replicas for showing how those involved in the project are seeing the evidence. The replicas function not so much as facsimiles of artifacts but instead as models of theories. What the replica does is to illustrate the theory that this is an image of Jonah and the fish. The shading of the "tail" is irrelevant to that theory, just as the shading in the border triangles is irrelevant, so they are left blank. 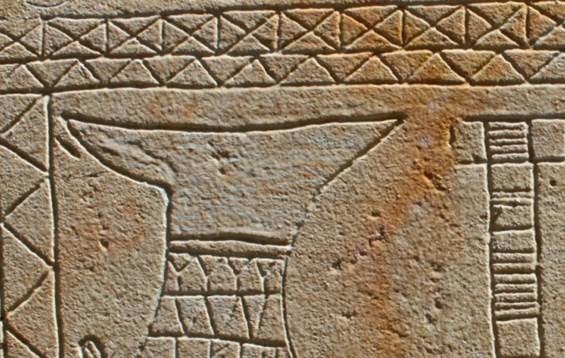 It is the same issue as the alleged "YWNH" inscription, that the elements relevant to the model are illustrated and the elements that do not fit the model are not illustrated. For what it's worth, I don't think that there is anything wrong with providing helpful illustrative models of theories. In fact, I think it's a really useful way of proceeding because it helps one to explain the theory as clearly as possible so that scholars can assess it. The point is to be clear in this context about what the replicas are -- they provide illustrative models for a theory. 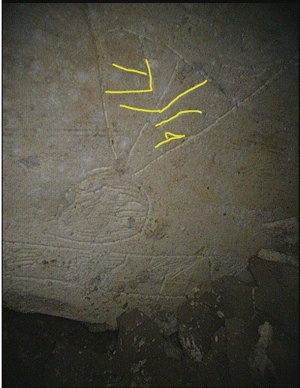 Nevertheless, the issue over the replicas, like the issue earlier over the CGI composite image (originally simply called a "blow up"), is that a fascinating and highly worthwhile project of excavation, exploration and analysis has become inextricably linked with a particular theory about the project, a theory that many of us regard as untenable. In other words, it is a project that is driven by an interpretative model that has serious problems. Unfortunately, the analysis of the finds is difficult because any resistance to the project leaders' theory is interpreted not as honest, rigorous, critical analysis of the evidence, but as irrational reflections that proceed from some kind of reactionary, theological agenda. But this is why I refuse to engage in the kind of playground games that the project leaders like (see Response to Simcha Jacobovici's "Pants on Fire") and instead prefer to reflect critically on the evidence. The University of Gloucestershire has announced the appointment of the eminent theologian, author and academic, Professor Philip Esler, to one of its most distinguished posts - the Portland Chair in New Testament Studies. The Portland Chair is an important part of the University’s theological tradition, which dates back to its foundation in the 1840s. The Chair is supported by an endowment from the Kirby Laing Foundation, which has also endowed chairs at the Universities of Oxford, Cambridge and Aberdeen. The Chair leads the University of Gloucestershire International Centre for Biblical Interpretation, and the position must be filled by a distinguished scholar who has an interest in the theological interpretation of the Bible. Professor Esler has been appointed to the Portland Chair in succession to Professor Andrew Lincoln. Professor Esler was born in Australia, and trained as a lawyer. He attended Magdalen College, Oxford in 1981 to study a D. Phil in the New Testament. He became the first Chief Executive of the Arts and Humanities Research Council in 2005, and in 2010 became Principal and Professor of Biblical Interpretation at St Mary’s University College in Twickenham. He is a member of the Council of the Society of Biblical Literature. His new role will include undertaking research and writing for publication, supervision of research degrees, mentoring staff, contributing to teaching programmes in theology and religious studies, and acting as an ambassador for the University and School of Humanities . . . .
More at the link above. Great news for the University of Gloucestershire and its students! 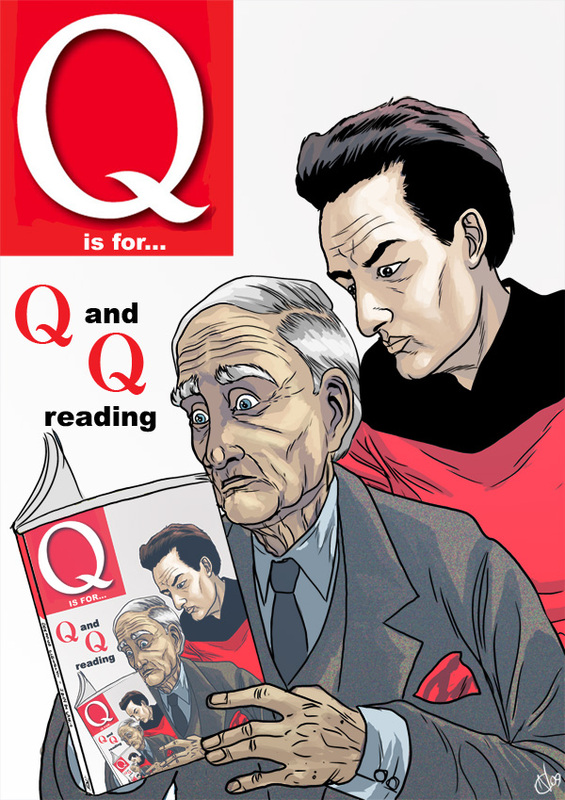 Q and Q reading the Critical Edition of Q! "Anyway, I love this cartoon in which those two famous Qs read the British magazine Q. It would be even better if they were reading the Critical Edition of Q, but you can't have everything." 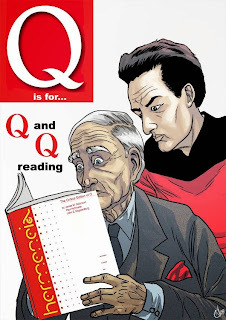 And now, here are Q and Q reading Q! We reached the stage of my New Testament Intro class today when we were looking at the question of Q. It's tough to teach because one has to explain to puzzled students why Q is a credible theory, and why it is the dominant one in the field. Luckily for me, I have an "out" in that I am sure there never was a Q, and I can explain why the standard arguments for its existence are problematic. I sometimes wonder how far famous fictional Qs like Desmond Llewelyn's Q in James Bond or John de Lancie's Q in Star Trek: The Next Generation make our Q feel rather exotic. Perhaps it's a problem for the Q theorists because the most famous Qs are fictional. Perhaps it's a help to them because it gives their hypothetical source a certain frisson. Anyway, I love this cartoon in which those two famous Qs read the British magazine Q. It would be even better if they were reading the Critical Edition of Q, but you can't have everything. The cartoon dates back to 2010, from Neil Cameron's excellent A-Z of Awesomeness, previously mentioned here. NT Pod 66: Oral Tradition and the Game of "Telephone"
It's been far too long since we've had an NT Pod! I've put out a new episode tonight, NT Pod 66: Oral Tradition and the Game of "Telephone". It relates to something that has come up here before, the question of whether the game of "telephone" (known in the UK as "Chinese Whispers") is a good analogy for the early Christian traditioning process, discussed in a post on The Gospels and the Telephone Game. See too Missives from Marx. You can listen to the NT Pod online or subscribe in your preferred reader or subscribe via iTunes. 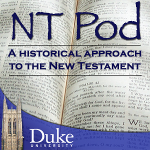 You can also find the NT Pod on Facebook, or follow the NT Pod on Twitter. 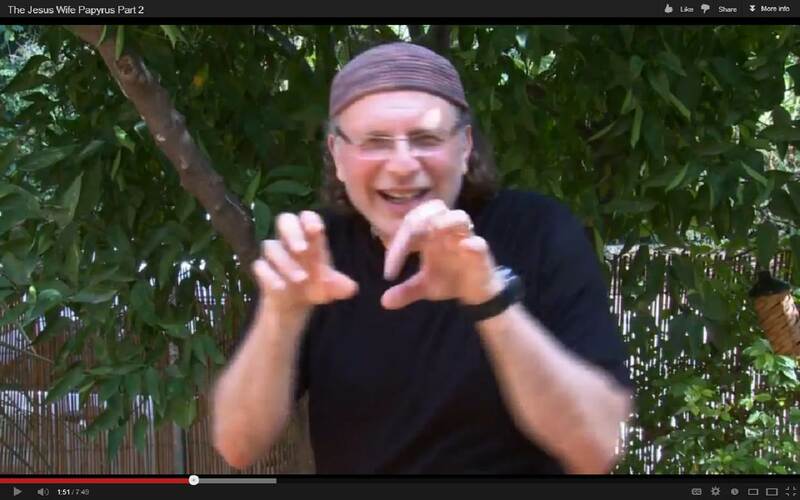 Response to Simcha Jacobovici's "Pants on Fire"
I am grateful to Simcha Jacobovici for taking the time to respond to my blog post A Tale of Two Replicas in which I detailed the differences between the two replicas of Ossuary 6 from Talpiot Tomb B and asked some questions about them. 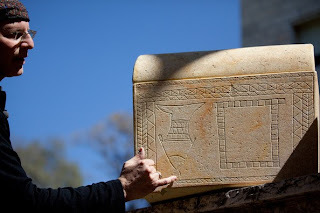 I have been blogging and writing about the Talpiot Tombs for several years now and although I have sometimes received indirect responses from members of his production team, this is the first time that Jacobovici has responded himself. I had always assumed that he did not read my blog, especially as I have often engaged with his theories about the tombs, so it was a honour to receive a public response to my most recent post. Jacobovici's post is entitled Pants on Fire. Although the primary reference is presumably to the rhyme, "Liar, liar, pants on fire", from the school playground, it is also a clever and amusing allusion to Jacobovici's characterization of his critics as underwear bloggers, and I am apparently a member of this group. Most of Jacobovici's post is general abuse, some of it quite funny, some of it puzzling, most of it presumably intended to provoke a reaction. I am grouped together with others like Prof. Robert Cargill and we are regarded as "personal and hysterical", "masquerading as scholars", "enforcers of Pauline theology" (?) who make "libelous statements". It is "pseudo-scholarship" that aims "to rewrite history in Orwellian fashion". Jacobovici ends the post by planning to take a shower "because I feel slimed by these guys". Although most of the post is in that vein and so of limited use in the actual discussion, there is some content. I am pleased to see my basic contention verified, that there were indeed two separate replicas made of the ossuary in question, and that there were significant differences between them. Replica 1 was produced first and Replica 2 later, in April 2012. Prof. James Tabor kindly clarifies the matter further in a useful comment to my post, and he expresses some surprise that I had not realized that there were two different replicas. I suppose that I in turn should express some surprise at Tabor's and Jacobovici's surprise. They have consistently talked about the museum quality replica as if there were only one and before posting on the topic, I reviewed everything that I could find. I could not find any statement anywhere about the production of a second replica, in the media, in the blogs, in correspondence, in the official website. They repeatedly and consistently talk about just the one replica. And from the reactions more broadly to my post, I can tell that no one else seemed to realize that there was more than one replica. However, it turns out that I had in fact missed something, and for this I apologize. 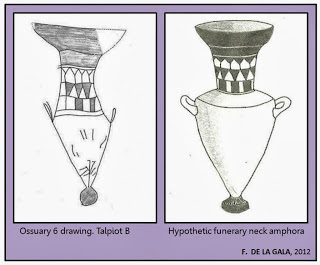 About half-way through a lengthy post on another subject on 4 January 2013, nine months after Replica 2 was produced, James Tabor mentions the two replicas, and provides a picture of each, with a view to making some insinuations about Amos Kloner. I had missed that paragraph in my research. Mea culpa. And it turns out that while Jacobovici himself had not talked about the two replicas (again, subject to correction, as always), he did re-blog Tabor's blog post in which that paragraph appeared, at the same time, ninth months after its production. The point of my post, though, was to draw attention to differences between the two replicas and to ask some questions about them. Tabor confirms my point that the "fish in the margins" were adjusted between the production of the two replicas, apparently in response to scholarly critique of the way that they had been represented (the critique was by Robert Cargill, though neither Tabor nor Jacobovici mention this), and it is useful to know that. My key question related to the replica shown to Prof. Émile Puech. Since it is on video, there is no doubt at all that the replica is informing the discussion. It is clearly Replica 2, the replica that features an apparent attempt to spell out "YWNH" (Jonah), in contrast to Replica 1, which does not have it, and which was produced before the "YWNH" inscription theory had emerged. Jacobovici does not comment on this issue, the relationship between Puech's statement and Replica 2. A further issue does arise from this about how accurate the "museum quality replicas" really are, but that's a blog post for another day. The recent renewed discussion of the Talpiot Tombs, brought about by Simcha Jacobovici's post featuring an interview with Professor Émile Puech of the École Biblique in Jerusalem (See Simcha Jacobovici and the Talpiot Tomb again), and followed up by Prof. Puech's own statement on the affair , has sent me back once again to the photographs, the blog posts, the media reports and the articles that I have in the past spent such a long time looking at. But this time I spotted something new, what I am calling "A Tale of Two Replicas". Throughout the discussions of the Talpiot Tomb, right from the first, Simcha Jacobovici, James Tabor and others involved with the "Jesus Discovery" project (website here) have talked about and publicized what they call "the museum quality replica" of ossuary 6 from Talpiot tomb B. But here's the curious thing. It's not one replica. There are two different replicas. As far as I am aware -- and I think I have read everything -- they have never admitted that they produced a second replica to replace the first. (Please correct me if I am wrong). And when one notices what changes between the two replicas, there is some cause for concern. Here is the first replica. This one was on the first version of the Jesus Discovery website and dates back to when the site was first published in February 2012, as you can see from the archive.org capture. Here is the second replica, which dates back, as far as I can tell, to April 2012, and which replaced the first on the Jesus Discovery website. This is the one you see there now. Similar observations could be repeated for other elements in the two replicas, but I am sure that you get the basic point. Now one of the reasons that this is worthy of comment is that the replica (singular) has always been called "museum quality" and its accuracy has been praised. Yet, far from this being one, accurate "museum quality" replica, it is two contrasting replicas, in which attention to detail is far from the order of the day. It is not just the question of accuracy and representation that is at issue here, or the apparent failure to flag up the differences between the two replicas. It is that Replica 2 makes several changes that may be the result of engaging with criticisms of the project. Let me attempt to explain what I am getting at. 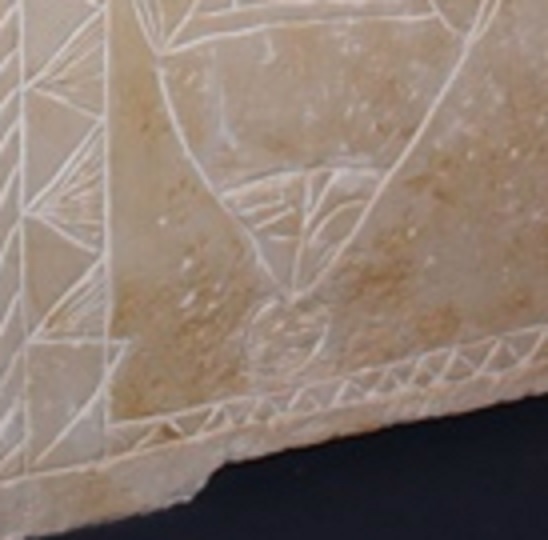 This replica appears to have been produced before the "YWNH" inscription theory had emerged. The lines really look like random lines. Notice in particular what would become the letter "nun" -- it is here completely broken, just as it was in the CGI composite photograph and all the pictures up to this point (Do the lines in the "fish" head spell out Jonah?). No one looking at this picture would for a moment think it was spelling out "Jonah". In each, the "yod" has a loop, the "nun" is unbroken and the top line of the "he" does not extend all the way to the border. 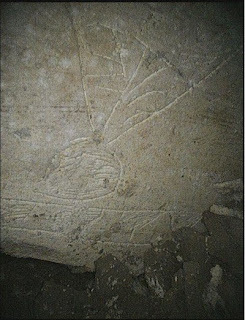 I don't know what to make of all this, but I thought in the interests of analyzing Talpiot Tomb B, and the claims made by those involved with the "Jesus Discovery" project, it would be useful to lay out what I have found by analyzing the two contrasting replicas, and to see if others also see what I am seeing. Why is it that the "fish in the margins" are recrafted in between Replicas 1 and 2? Why is it that the "YWNH" inscription suddenly becomes clear only in Replica 2? 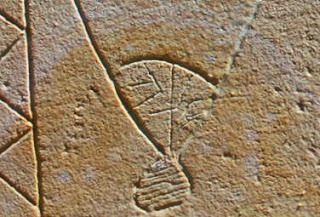 As we have seen above, it is only Replica 2 that has a representation of the "YWNH" inscription that conforms with the interpretation of those involved in the project. Did the representation of "YWNH" on Replica 2 influence Prof. Puech's reading? 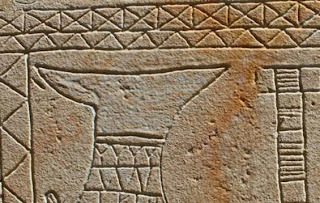 I expressed some surprise over Prof. Émile Puech's apparent endorsement of Simcha Jacobovici's claims about the Talpiot Tombs on Thursday in a post headed Simcha Jacobovici and the Talpiot Tomb Again. It now appears that Prof. Puech is very unhappy with the way that he was treated by Jacobovici and he has spoken out about this, first in en email reproduced on Jim West's blog, and subsequently in emails to several scholars including James Tabor, who publishes the email in a blog posted headed Emile Peuch’s [sic] Position on the “Jesus Discovery” and “Lost Tomb of Jesus” Films. I am grateful to Prof. Tabor for publishing Prof. Puech's comments, and I think it is greatly to his credit that he has done so. I hope that Simcha Jacobovici will be issuing a public apology to Prof. Puech as soon as possible. Simcha Jacobovici and the Talpiot Tomb Again! I have spent a lot of time, some would say wasted a lot of time, engaging critically with claims made by Simcha Jacobovici in relation to two tombs excavated in Talpiot, East Jerusalem. 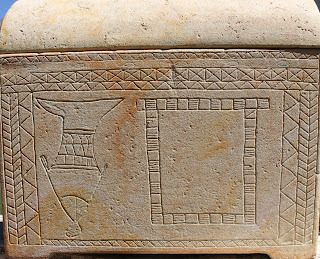 I won't go into detail on how things have panned out in the past, but I documented some of it in my article published on The Talpiot Tomb and the Bloggers, and have written a lot about it here on the NT Blog. My most recent extended discussion is found on Bible and Interpretation, The Jesus Discovery? A Sceptic's Perspective, an article based on an enjoyable critical exchange with James Tabor and Christopher Rollston at SECSOR in March this year. The general response from Simcha Jacobovici himself has either been dismissal or mockery. Although he asked his critics to point out the mistakes, he has never responded to my attempts to explain why I am unconvinced by his claims, preferring instead either to ignore the critical response or to mock what he calls underwear bloggers. That's me, and people like me, sitting on the couch, blogging in our underpants while we eat takeaway pizza! In a post published yesterday, Jacobovici draws attention to a new interview with Professor Émile Puech of the École Biblique in Jerusalem, Jesus Tomb Finds Dramatic Support. 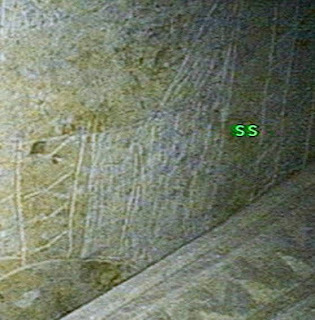 The post includes a video interview with Prof. Puech, who explains Jacobovici's theory about the tomb, indicating his own support for this interpretation, that the controversial image is actually an upside-down fish spitting out a stick-figure Jonah. It is not a standard vase or vessel. 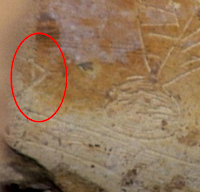 Moreover, Prof. Puech lends his support to the suggestion that the name "Jonah" is spelled out in Hebrew on the "head" of the "fish". I must admit that I was a little surprised to see an esteemed, senior figure like Prof. Puech supporting Jacobovici's interpretation of the ossuary. I accept that there will be disagreements in the guild, and that this is the stuff of academic debate. 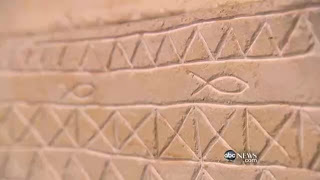 I would love to be able to ask Prof. Puech what he makes of things like repeated geometrical shapes in the body of the "fish" that correspond to the same geometrical patterns on the borders of the ossuary, or the handles on the "half-fish", which make the Jacobovici interpretation so problematic for many of us, but I doubt that I will get the opportunity. Nevertheless, that's the substance of academic debate, and I accept that academics just disagree with one another. I should perhaps admit also that I was disappointed that there was no new substance in Prof. Puech's interview, i.e. there was nothing to refute those who have argued against Jacobovici. It is interesting nevertheless that Prof. Puech is convinced by Jacobovici's unusual claims. I find it surprising, baffling even, but there we are. That's life in academia. However, I do want to draw attention to elements in Jacobovici's post that I think problematic. He attempts to summarize the debate so far, incorporating discussion of both Talpiot Tombs, and drawing attention to why he sees the case for the identification with Jesus and the Jesus movement to be so strong. 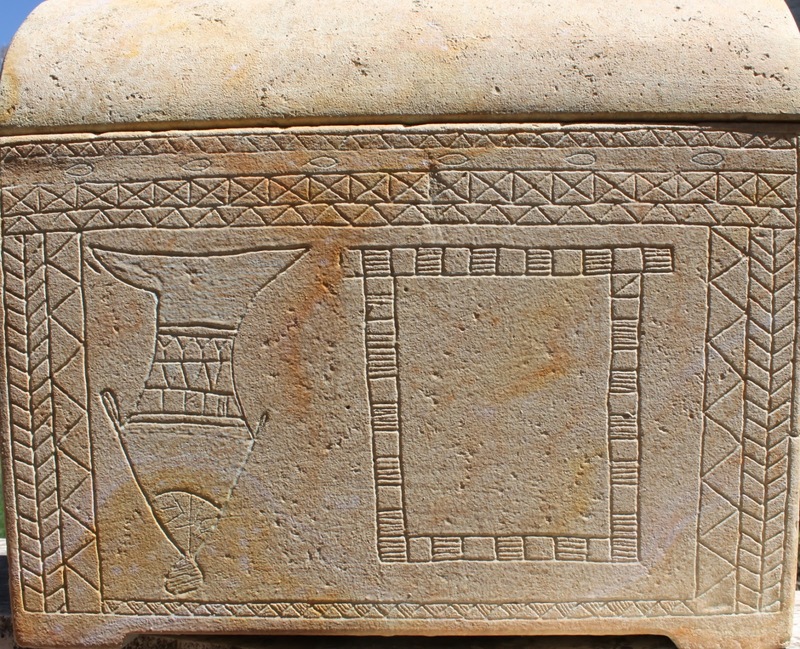 (1) "Six of them have inscriptions. One of them explicitly states; 'Jesus, son of Joseph'"
It may be that Prof. Puech has changed his mind about this but, if so, there is no indication of this in the current article. This is not to say that the inscription could not be "Jesus" but just to draw attention to our uncertainty about the reading. It is absolutely not "explicit". (2): "A third has 'Yose', a very rare version of Joseph. 'Yose', 'Joses' in the King James version of the Gospels, is described as a 'brother of Jesus' by the Gospels of Mark (6:3) and Matthew (13:55-56)". This is incorrect. Only Mark has "Joses". Matthew has "Joseph". And the textual witnesses demonstrate unequivocally that the two names were regarded as interchangeable. (3): "If this is not enough, there was an inscription in Greek of a certain Mary called 'Mariamene'. In all of Greek literature, this particular spelling of Mary is used in reference to Mary Magdalene and no one else." This is false. The word "Mariamne" is used twice in early Christian literature, once by Hippolytus (third century) and once in the Acts of Philip (fourth). On neither occasion does the author say that this Mary is "Mary Magdalene". Indeed, both authors, Hippolytus and the author of the Acts of Philip, depict Mariamne as having a sister named Martha, which illustrates that they are not talking about the historical first century figure of Mary Magdalene but the later, composite literary figure of the apocryphal Mary who incorporates characteristics from the full range of Marys. Now of course it could be the case that my readings of the primary texts are wrong, in which case I would welcome some good, robust, critical engagement. My guess is that I am more likely to receive dismissal or abuse, which is the norm, but I am always happy to be surprised. I've greatly enjoyed the first couple of episodes of Simon Schama's Story of the Jews currently airing on BBC2. 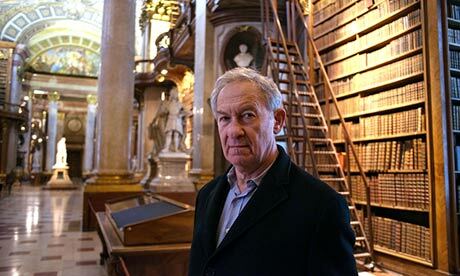 Schama is a wonderful story-teller and he knows how to make his subject matter compelling and memorable, always very impressive given the constraints of the documentary medium, with the need to summarize, to simplify, to splice and dice. Born a Jew, like his saviour, was Paul who, within a few years of Jesus' death began the process of liberating Christianity from the claims of Jewish ritual. Christianity was either universal or it was nothing. So Paul aggressively de-Judaizes the Christian message and there was no surer way of doing that than insisting on the divinity of Jesus. That violated the first supreme principle of Judaism which was the indivisible oneness of God. Echad. Two: "Father and son" had Jews scratching their beards. Three: "The holy spirit". Why not five? And it was Paul who repeated the sinister note sounded in the early Christian Gospels, -- the Jews as Christ-killers crying out for Jesus' crucifixion -- "his blood be on us and on our children". (1) Although Schama acknowledges that Paul was "born a Jew", the implication is that Paul converted away from Judaism to something different, called "Christianity". But Paul never mentions "the Christian message" or "Christianity" and he would have been appalled by the notion that he "de-Judaizing" anything, still less that he did so aggressively. 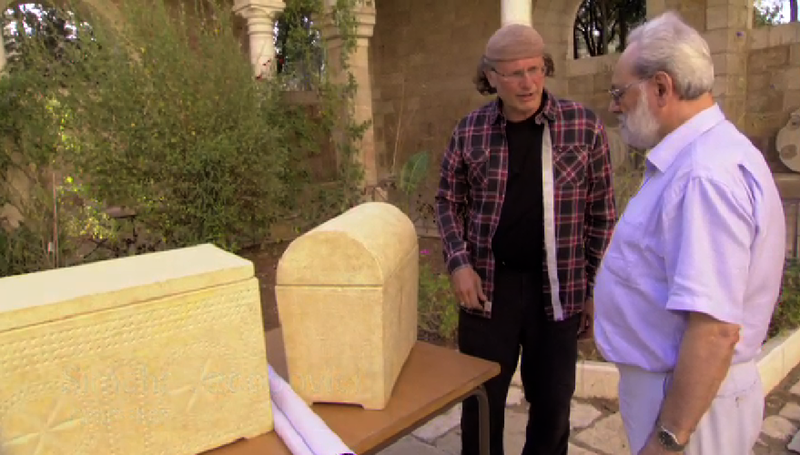 Paul insists on his Jewish identity and without understanding that, one cannot understand Paul (Phil. 3.4-6, Rom. 9.1-5) or, for that matter, the early Jesus movement. Schama's misunderstanding is a classic one. Paul is an eschatological Jew who believes that the Messiah has come and that the Gentiles are now being included in the people of God. He is not founding a new religion purged of Jewish ritual. (2) Affirming Jesus as Messiah and God's son did not "violate the first supreme principle of Judaism". On the contrary, Paul believed that Jesus' appearance was an affirmation of that very principle, and he goes to some pains to stress this in his Christological re-affirmation of the Shema (1 Cor. 8.6, "Yet for us there is one God, the Father, from whom all things came and for whom we live; and there is one Lord, Jesus Christ, through whom all things came and through whom we live"). Nor does Paul talk about "the holy spirit" as a person of the trinity -- this is as anachronistic as "Why not five?" is sarcastic. (3) No one, apart perhaps from some fundamentalists, think that the Gospels were written before Paul. The line that Schama is quoting is from Matt. 27.25 and all contemporary scholars date Matthew long after Paul, some by decades. So Paul is not "repeating the sinister note sounded in the early Christian Gospels", nor is that note found in Paul, who does not have a Passion narrative in his letters. To reiterate, I think this is a superb documentary and I am a big fan of Schama. But I think this section falls below his usual standards. One of the reasons that this is important is that getting the history right plays a key role in Jewish-Christian relations. Given the appalling history of Christian attitudes to Jews and Judaism documented by Schama, it is worth paying careful attention to what Jews like Paul, right at the beginning of the Jesus movement, actually said. How it used to look! This is how it used to look back then (or at least as far back as I can get it on the wayback machine). I must admit that I rather liked the old design, which I hand-coded. That NT Gateway logo was designed by a nice guy called Geoff Love. One of the funniest things is looking at the blogroll back then -- just two blogs! A few weeks later it had expanded to four. Good grief -- no wonder it was so much easier to keep up with what was going on in the blogosphere! NT Blog's Ten Year Anniversary! Happy birthday to me! The NT Blog is ten years old today. Its first post in what was then called "The NT Gateway Blog" went out on September 2 2003, Welcome to the NT Gateway Blog. 3,887 posts later and we are still here! I began this blog as a bolted on extra to the New Testament Gateway which was then absorbing a huge amount of my time. I'd been a fan of Jim Davila's Paleojudaica for a while and one day it dawned on me that I could do something similar. I had never even heard of blogging until Paleojudaica appeared, and it struck me that a blog would enable me to gather together lots of the things that I had been trying to do with the NT Gateway, like drawing attention to great websites and adding "notices" of forthcoming events as well as, at the same time, discussing the New Testament in the news. As time went on, the NT Blog became bigger than the site that spawned it, and the proliferation of other blogs enabled me to find my own niche. I still wish that I could post more often, but I enjoy the blog, and I enjoy participating in the blogging community where I have found friends as well as some great intellectual stimulation. I have written so often about the art of academic blogging, its successes and failures, that I don't have anything fresh to add here -- so please check out this cache of posts if you are interested: NT Blog: Academic Blogging. My previous blogiversary posts are self-indulgently gathered here. David Meadows celebrates ten years of Rogue Classicism today too -- don't forget to pop over there to thank him for all his great work over the years. If only I had posted so often! Many thanks to everyone over the years who has offered encouragement and who has commented and provided interaction on the other blogs. There's no question about it -- it's the communal side of blogging that makes it worthwhile.